“Please” was the fourth single released from the Pop album. In the USA it contained both studio and live tracks, but elsewhere, the live tracks were packaged separately as the “PopHeart EP.” “Please” was initially released in the UK on September 22, the same day as “PopHeart.” In Australia, “Please” was released on September 29, and “PopHeart” would follow on October 13. In Canada, “PopHeart” was released first, on October 7, with “Please” coming two weeks later, on October 21. In the United States, the release was delayed several times, reportedly due to issues with the cover image. It was finally released on November 25, 1997. 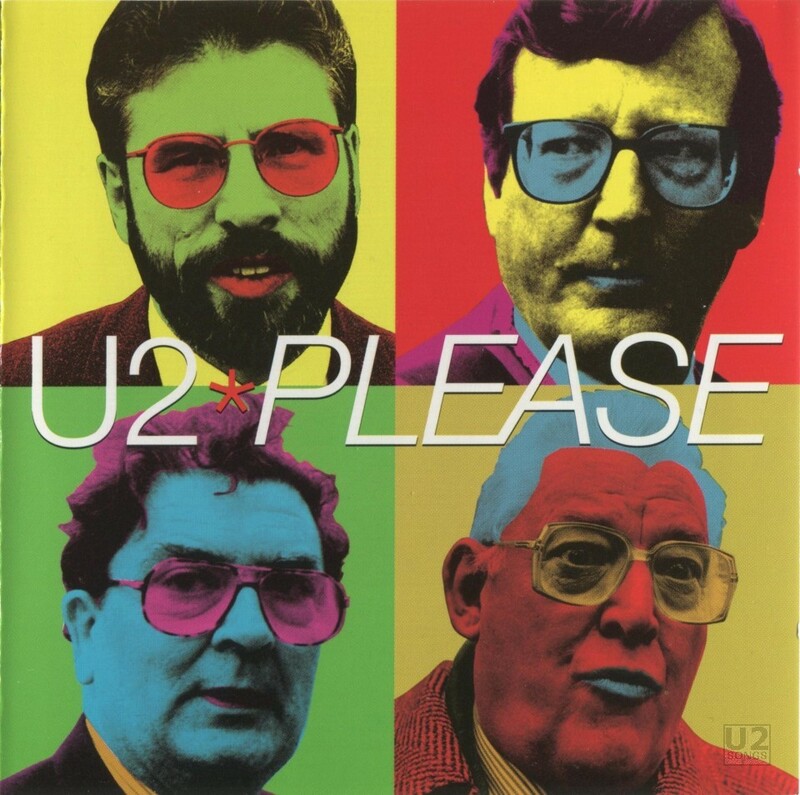 The sleeve of the “Please” single featured four men on the cover with day-glow tinted faces. They were Gerry Adams, leader of Ireland’s Sinn Féin party, in the top left corner; David Trimble, of the Ulster Unionist Party, in the top right corner; Ian Paisley, leader of the Democratic Unionist Party, in the bottom right corner; and John Hume, leader of the Social Democratic and Labour Party, in the bottom left corner. All four were involved in the contentious Northern Ireland peace process at the time, which was itself part of the inspiration for the song. The “Please” single featured a newly recorded version of the title track. Like “Last Night on Earth” before it, U2 were unhappy with the original version on Pop, feeling that it was unfinished as a result of the last-minute time crunch surrounding the delivery of the album. U2 recorded this new version at Wisseloord Studios in Hilversum, Netherlands while on The PopMart Tour. Two-track cassette and CD formats of the single included the single version of “Please” as the A-side and “Dirty Day (Junk Day),” a remix of a track from Zooropa, as the B-side. Maxi-CD formats added a second remix of “Dirty Day.” Both remixes were done by Butch Vig and Duke Erikson. Vig is a member of the band Garbage, which shares U2’s record label and which also opened for the band during some stops on The Elevation Tour in 2001. The final studio track was an instrumental version of the song “I’m Not Your Baby,” which U2 had recorded with Sinéad O’Connor for the soundtrack to Wim Wenders’ film The End of Violence. In the US, the “Please” single included the four live tracks that were released on the “PopHeart EP” elsewhere, but did not include the remixes of “Dirty Day” and “I’m Not Your Baby.” More information on the live tracks can be found under the “PopHeart EP” listing. There were two videos filmed for “Please.” The first was directed by Anton Corbijn and produced by Richard Bell in September 1997. It takes place in a small village with a cloudy sky overhead. It includes images of people on their knees, either staring at the camera or shuffling around, interspersed with clips of Bono singing the lyrics. A young girl and an older man, who appears to be homeless with a sign around his neck that reads “Please,” are distinguished from the other characters in the clip. When the song kicks into high gear, the footage of Bono becomes coloured, and most of the the characters rise from their knees while the older man falls to the ground. It is a very stark and grey video, contrasting strongly with the bright lights of the early videos released off of Pop. The second video for “Please” is a live clip, directed by Maurice Linnane and produced by Ned O’Hanlon. The sound in this video is from the Helsinki PopMart show on August 9th, 1997, and the footage consists of various concerts from The PopMart Tour, including Las Vegas and Rotterdam. This second video is known as the “Live Mural Cut.” The live footage is interspersed with images of political murals in Northern Ireland, manipulated to look like waving flags. This footage was used for U2’s performance of “Please” at the 1997 MTV Video Music Awards. The live video is often incorrectly identified as being from the Rotterdam concert, rather than Helsinki. “Please” debuted in the live set during The PopMart Tour, and was played at every stop. It was also performed at the Tibetan Freedom Festival in New York, and at the MTV Video Music Awards—also in New York—in 1997. A stripped-down version debuted on the third leg of The Elevation tour. It has not been played in full since that time, but snippets were incorporated into other songs during both the Vertigo and U2360° tours. Live versions of “Please” have been released on the “PopHeart Live EP” (Rotterdam, July 18, 1997) and on the Hasta La Vista Baby! fan club album (Mexico City, December 3, 1997). “Please” was not included on The Best of 1990-2000 CD. However, “Dirty Day (Junk Day Mix)” did appear on the b-sides disc accompanying that release, and the “Please (Live Mural Cut)” video was included on the “History Mix” DVD that was bundled with the double CD set. The Anton Corbijn version of the video was included as a bonus track on The Best of 1990-2000 DVD, with optional commentary from the director. Mastered by Howie Weinberg and Digital Editing by Andy Van Dette, Masterdisk, New York. Post Production and Supervision: Cheryl Engels, Partial Productions Inc. Produced by Flood, Brian Eno, and the Edge. Recorded and mixed by Flood and Robbie Adams. Additional production and remix by Butch Vig and Duke Erikson at Smart Studios, Madison WI. Cello: Mary Gaines. Produced by Howie B and Flood. Recorded by Mark ‘Spike’ Stent. Assisted by Rob Kirwan. Mixed by Howie B. Assisted by Paul Falcone at the Hit Factory, NY.